February’s wintry white backdrop is a perfect canvas for a splash of colorful pinks and reds entwined with affection and a dash of romance for a most welcome respite. This Tea for Modern Times is the quintessence of love, which is most appropriate for mid February but also ideal for any day of the year. This tea is really quite effortless to prepare by simply incorporating some special homemade treats and supplementing with a mix of pretty bakery cookies and or chocolates. For this tea, I chose to make chocolates and cookies with an intricate romantic heart lace etched mold festooned with charming love birds manufactured by the Brown Bag Cookie Company. The date that is imprinted in the back of the mold lets me know that it was cast in 1984. This company is no longer manufacturing cookie molds but you can still find their equally elaborate shortbread molds in specialty shops across the country. I purchased several Brown Bag cookie molds years ago and set them aside to use later. Truthfully, I didn’t think later would be a few decades! The molds are spectacular and can be used in a multitude of ways including baking cookies or molding chocolates. In addition they are striking as decorative ornaments in a kitchen or pantry. To make fabulous decorations for holidays you can pour wax into the molds for ornaments or create embossed cards by using casting paper and then painting them. If you choose to use them for arts and crafts then it is best not to use them with food products as the molds are porous and the chemicals in the colored wax and paper may affect people adversely. 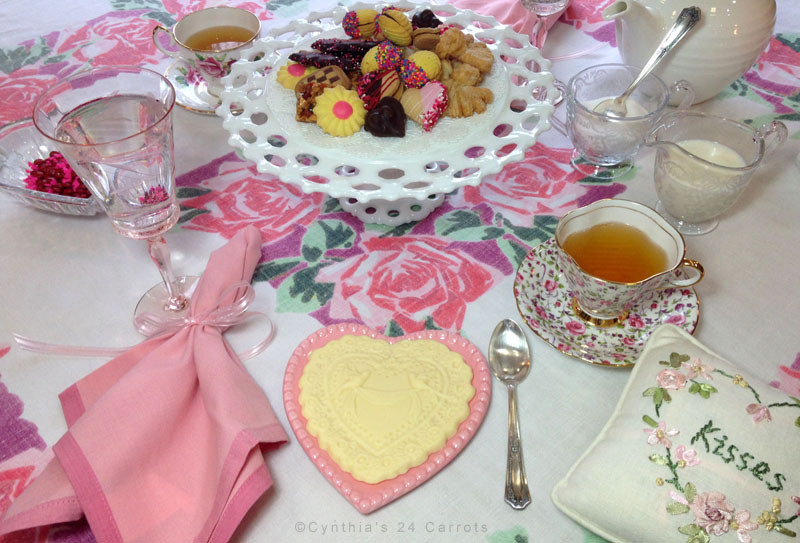 Our Romantic Tea for Two began with ginger shortbread molded cookies and chocolate molded hearts. These were complemented by an assortment of bakery cookies with a few heart shaped cookies added in keeping with the theme of romance. The table was set with a vintage linen tablecloth covered in roses. Two-toned pink napkins that were purchased at a local department store were dressed up with satin ribbon tied in dainty bows. The centerpiece chosen for this Tea for Modern Times was a mid century, white, ornate, milk glass cake stand which was embellished with bakery cookies that were chosen for their shapes as well as splashes of pinks and reds. 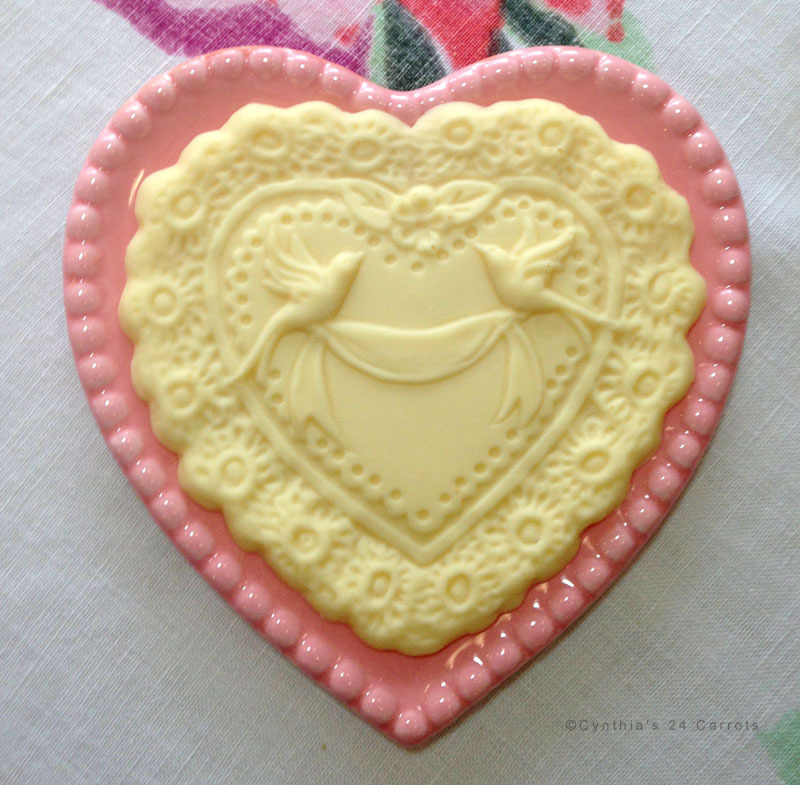 Heart shaped plates in winter white and pale pink were just the right accoutrement for the home made treats. A white Linea, bone china tea pot was used to brew English breakfast tea. The matching creamer and sugar bowl are Romance by Fostoria. They are a most appropriate addition to the table. I chose a pair of Depression glass water goblets in a subtle hue of pink to blend with our color pallet to add interest to the table setting. 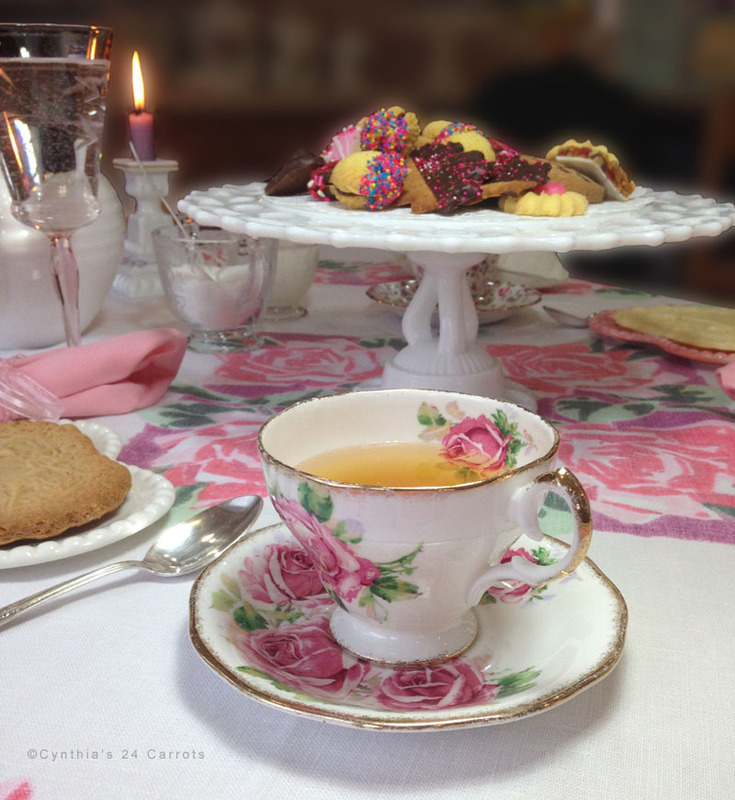 Two floral mismatched English bone china tea cups and saucers were incorporated for whimsy. The silver plated tea spoons, reminiscent of the Art Deco era added an element of loveliness to complete the setting. English breakfast tea was poured, which complemented rather than competed with the ginger shortbread, chocolates and cookies. This tea provided a splendid escape from a cold winter afternoon. Of course, you do not have to wait for February to indulge; any day of the year would be perfect for a splash of romance!